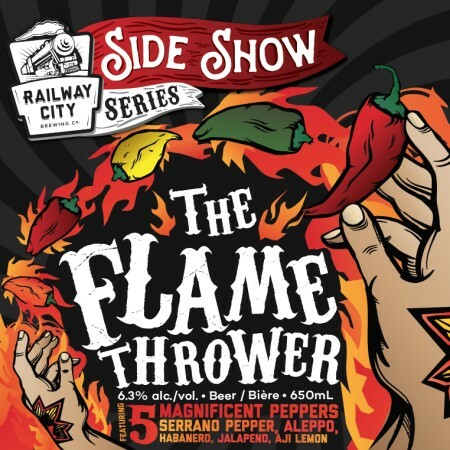 ST. THOMAS, ON – Railway City Brewing has announced details of the latest release in its Side Show Series of circus-themed limited edition beers. The Flame Thrower pours a golden orange colour with an off-white head. Aromas of sweet honey, citrus and pear are at the forefront with an underlying hint of bubblegum. Citrus rind and stone fruits dominate the palate and end with a venous finish. The use of five different peppers including seranno, aleppo, habanero, jalapeño, and aji lemon to provide a subtle heat that builds – a perfect medium-bodied patio sipper. The Flame Thrower will be released at the brewery on Cinco de Mayo – Friday May 5th – at 11:00 AM. It will be available in a limited run of 650 ml bottles at the Railway City brewery store, and on draught at select local bars and restaurants while supplies last.